Want Big Money??? Here is a unique novelty item for the passionate Buffalo Nickel collector. 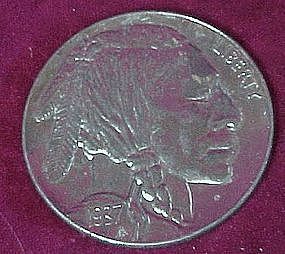 This is an aluminum replica of the 1937-D 3-Legged Buffalo Nickel. It measures 3-inches in diameter, and is about the size of a standard drink coaster. Makes a great paperweight or just a nice display item, and it's a lot cheaper than a real 1937-D 3-legged nickel. You'll be pleased with this neat novelty coin!